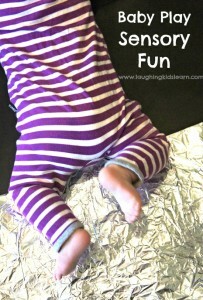 Struggling to know how to entertain your baby? 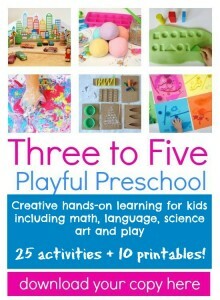 Well here is simple play idea that is easy to make at home and your little one will have lots of fun with it. 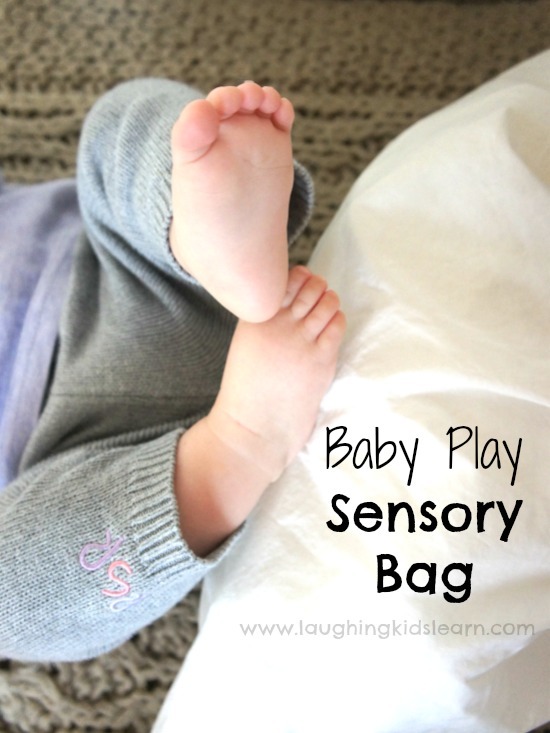 It’s a baby play sensory bag. Babies begin their learning journey the moment the arrive and so this sensory bag is a great introduction to developing their sense of touch, sight and hearing. Boo (6 months) is growing so fast. She is so aware of her surroundings and is now eagerly looking for new things to do and try out. 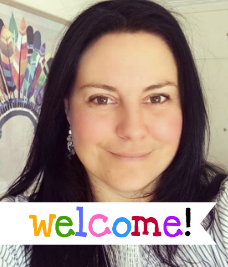 When Possum (aged 3.5 years) was a baby I enjoyed making DIY sensory boards, however, with Boo I wanted to try something different and so I created a super simple sensory bag! I can’t begin to tell you the fun Boo has had with her sensory bag and I’ve had just as much enjoyment from watching her play with it. 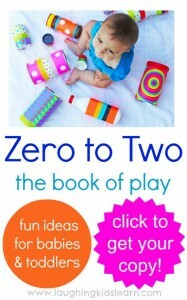 To make your own baby play sensory bag you will only need two things! 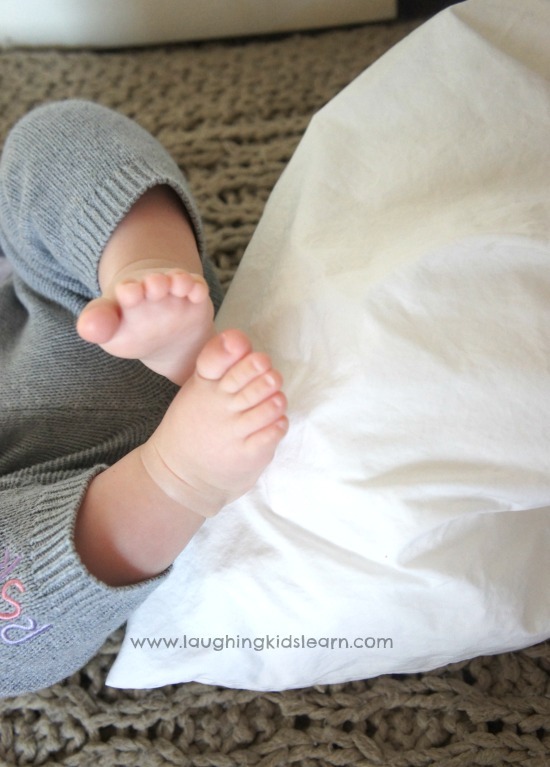 Firstly begin by finding a clean, cotton pillow case or similar. Do not use anything that has tassels or could cause choking. 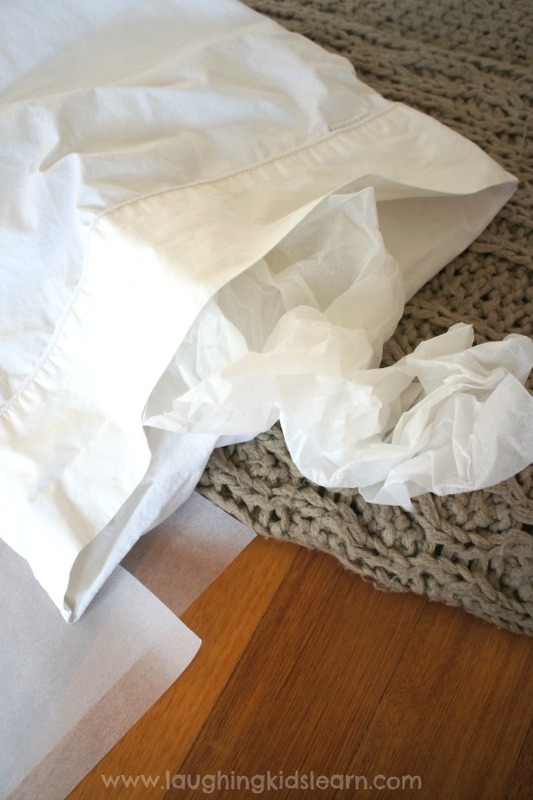 Tear off 4 x 1 meter sheets of baking (or parchment) paper and scrunch them into loose balls. You want to ensure these sheets fill half of the sensory bag and make it large and aerated. 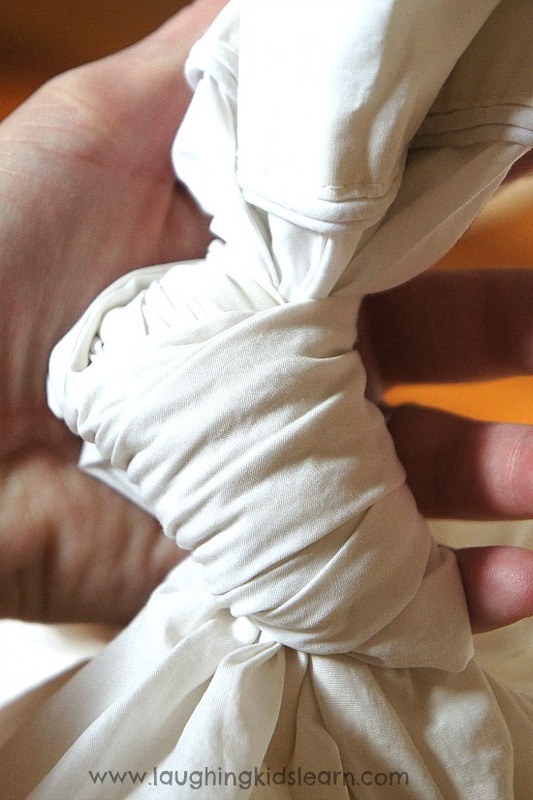 As soon as you’ve filled your sensory bag with the paper filling then tie the end of the bag tightly. Test out the bag by pressing it to ensure it is soft, light and making a wonderful crunchy sound! And that is all there is to it. 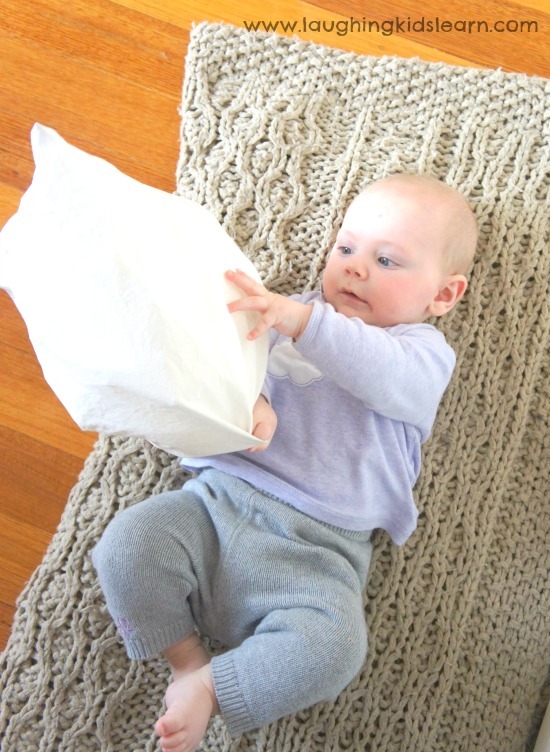 While you supervise, your baby will have a wonderful time playing with their sensory bag that is soft to touch, looks inviting to play with and creates a crunchy sound they can easily hear as a result of their playful actions. 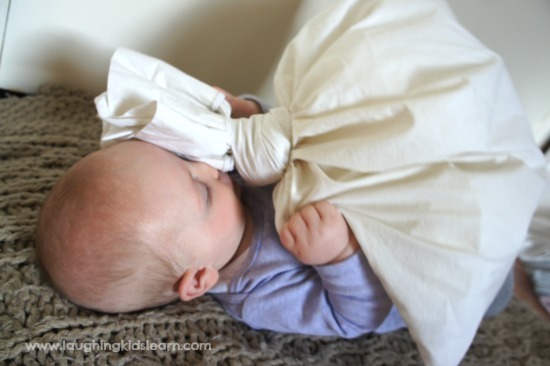 Another fun way to engage your baby in play using the sensory bag is to place it underneath their feet whilst they are on their back. 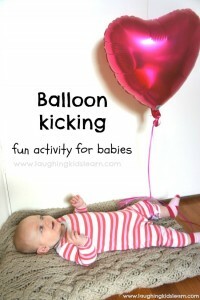 Young babies like to use their feet to kick and so this is encouraging them to continue that. Another approach to helping them learn about cause and effect and simply adding to their sensory experience. Boo particularly loved to rest the sensory bag on her tummy and use her hands to hit it. Obviously by doing that she was listening to the crunchy sound coming from the parchment paper inside the bag. This is also a clear example of your child learning about cause and effect, if I hit the bag a sound will be made. How awesome is that! 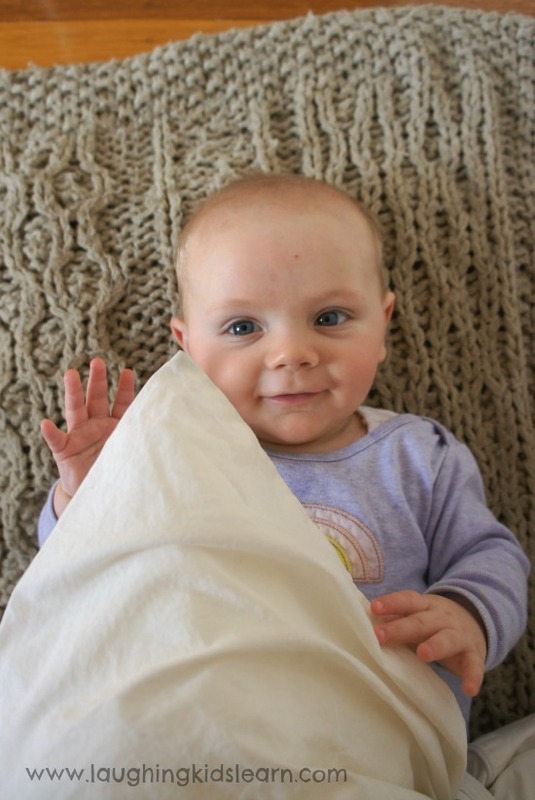 Some babies might not like this position, but it can help to encourage tummy time for those who normally detest it. Boo is quite happy with this position and enjoyed grabbing at the bag, gripping it with her fingers and thrashing it around as much as she could. What a muscle work out! It was fun to watch and she took on the challenge of needing to balance her weight while she played, which I thought was also very good for her core muscle development. So when you next have the time to watch and play with your baby you might want to have a go at making this simple diy baby play sensory bag. I’m sure your little one will love it as much as my Boo did. 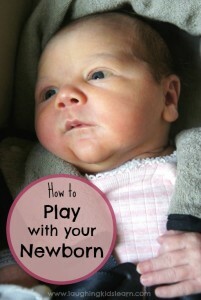 What other baby play ideas do you have? Why buy expensive toys when we can make such easy and safe toys all of our own to help in babies over all development. Loved the idea.